For many years, there has been one clear choice for businesses looking to satisfy their manufacturing needs. With a large, low cost labor pool, and developed infrastructure China was the default option for many companies with large manufacturing needs. According to a recent study by The Boston Consulting Group (BCG), companies who maintain this idea into the future will be at a disadvantage. With Chinese wages climbing 15 percent to 20 percent a year and the strengthening of the Renminbi, BCG predicts there will be a “tipping point” by 2015 that will make manufacturing in America the most attractive option for goods intended for the U.S. marketplace. Will Wages in China Equal U.S. Wages? After adjusting for productivity differences, China will still enjoy a nearly 40 percent labor cost advantage over the U.S. in 2015. The decision to outsource based on this fact alone will not yield an economical solution. Other conditions are shifting in China that are unfavorably factoring into production costs. Increasing shipping, inventory, and land costs over the next five years will lead to a production cost in China that is only 10-15 percent lower than in the U.S. However, these savings do not justify the additional intellectual property, security, corruption, and political risks associated with outsourcing. There are good reasons why a vast majority of companies chose China as their outsourcing destination. Other low-cost nations such as Vietnam and Thailand lack proper infrastructure or a sufficient labor force to undertake all of our manufacturing needs. Manufacturing trends have already proven that the industry is on the rise stateside. The Institute for Supply Management reported that U.S. manufacturing has expanded for 24 consecutive months and major corporations are leading the way; Ford has vowed to bring up to 2,000 manufacturing jobs back to the U.S. Unfortunately, many of these new jobs in America are remaining unfilled; employers are experiencing labor shortages despite a national unemployment rate hovering around 9 percent. A study by the National Skills Coalition found that 52 percent of employers in southern states, as compared to 14 percent a year ago are having trouble filling manufacturing jobs. Low production costs and policies aimed at increasing the middle skill labor force make states such as Alabama, Georgia, Louisiana, Mississippi, North Carolina, South Carolina, Tennessee, and Texas some of the most desirable production locales in the world for American businesses. Large scale Manufacturing has come a long way since it’s beginnings in the industrial revolution. Research, automation, and innovation have transformed jobs in the manufacturing sector from simply slapping a label on a can to operating intricate machines and solving problems on the fly in today’s streamlined production processes. These changes in the production process have been essential for increased productivity and growth, but have also made producer’s aware that there is a gap between the middle skilled labor they need to continue growth, and the labor they can find to fill these higher-skilled positions. The Skills Gap Report, a series of studies that examines the issues facing manufacturers found that, “67 percent of respondents reported a moderate to severe shortage of available, qualified workers and 56 percent anticipate the shortage to grow worse in the next three to five years.” In addition, their survey indicates that, “5 percent of current jobs at respondent manufacturers are unfilled due to a lack of qualified candidates.” Not only is it difficult to find new middle skilled workers, many existing employees lack the problem solving skills needed to adapt to their employer’s ever changing needs. In the American South, there is a clear mismatch in the supply and demand of labor. 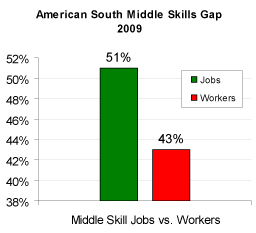 Middle skill jobs account for 51 percent of the region’s jobs, but only 43 percent of the regions workers are trained to the middle skill level. Solving this skills gap issue will take more than just effort on the manufacturer’s part; it will take teamwork from local governments, educational institutions, and corporations to help draw a path for workers to receive the right training for a career in manufacturing. In order for the U.S. to prepare for an influx and expansion of jobs in the manufacturing sector, the country’s workforce will first need to ready itself. Given today’s supply chains that depend on collaboration across business units and tolerate little room for error, employers are placing a higher value than ever on having a workforce that is highly skilled and flexible. To meet this need, there must be communication between employers and educational institutions to instill into the future workforce that employers will need a worker who is highly skilled, adaptable, and most importantly, willing to continue their education beyond the high school level. Companies should utilize diverse and dynamic supply chains to efficiently adapt to ever-changing market forces rather than be left behind. Manufacturing in China is not coming to a sudden halt, businesses will still want to take advantage of China’s booming 1.34 billion person consumer market. The major difference in the future will be that goods produced in China will serve the Chinese market instead of being shipped elsewhere around the world. It will still make sense to manufacture certain goods in China in which labor is a high portion of product costs and shipping time or logistics are not critical. With more choices, companies will need to conduct in-depth, product-by-product analysis that look at total cost instead of only labor rates when making strategic production decisions.